This blog entry about the events of Saturday, May 01, 2010 was originally posted on May 03, 2010. “I can’t get a picture without someone’s head in the way,” Scott told me, struggling to get a good picture. We held just two of hundreds of cameras that morning, from the hundreds of tourists who had spent the night at Huang Shan’s summit all for this one moment. I only managed to get a couple of decent pictures sans heads until I decided to get a bit dangerous and hang off the ledge of a crowded overlooking terrace by holding onto the guard rail chains for dear life. (There was no other way.) It was worth it, for it gave me the perfect vantage point to shoot the undisturbed picture above, plus this one, and that one. The sky got less visually dramatic as the morning wore on, prompting many to go back to their hotels and tents. Scott and Juju went back to bed for a bit, while I continued to wander around to find some sort of peace with the early morning scenery. Amazing that I’m here at a place that most of my friends don’t even know about, I thought to myself, feeling kind of proud. That moment of clarity was also short-lived because of all the talking voices; I was not the only one looking onward to the North Sea. After a bowl of congee and some Chinese breakfast buffet items, Scott, Juju and I head back on the trail — this time on the western steps as suggested by Lonely Planet. The map in the guidebook was inadequate with all the confusing pathways, and it was even more confusing with the park’s directional signs that failed to give enough informative reference points to figure out which way to go. “[Which way are you going? ]” asked a new voice, this one Australian-accented, from a new face who would soon to be the fourth musketeer of the day. “We’re trying to find the western steps,” I answered, struggling to open the first of many hickory nuts to stuff my face with that day. “I think it’s got to be that way,” he pointed, which was what we’d gathered too. His name was Tom, a techie program manager originally from Melbourne but working and living the London, who was on layover from a trip back to Australia for a wedding. “I’m here on layover so I figured I might as well check out China for three weeks,” he said. (That’s right, a three-week layover, folks.) He was traveling alone and seemed to be normal, so we let him tag along with us. It was part of the unspoken Ways of Independent Travel if you will, to extend such a gesture. He was a pretty outspoken guy as we talked about Chinese history and economics, the opium wars and British occupation, etc. ; he too raved about Shanghai, where he spent the past couple of nights at the oldest hotel in the Bund, where Charlie Chaplin and Albert Einstein once stayed in the 1930s. Unlike the three of us, Tom refrained from the hickory nuts we began binging on like squirrels with overeating disorders. The four of us trekked on, three westerners and a Chinese girl, amongst a sea of mostly Chinese tourists, trying to find the way back down the mountain via the Lonely Planet-dubbed “western steps.” Confusing at times since our guidebook’s map didn’t really sync the park’s maps, we went back and forth looking for the way. “We should have seen the lake already,” Scott said, wondering if we were lost or the map was wrong. Juju went to local workers to ask around in Chinese, as she did the rest of the day. “You’re lucky you have a Chinese girlfriend,” she told her boyfriend. “I FEEL LIKE I’M IN MECCA,” Tom commented as we made our way beyond Flying Rock through the mountains, and to a scene where tourists, in the thousands now, walking around a hotel and restaurant crowed by a big golf ball. “All the famous golf players in China come here,” he joked — although I was still too consumed with cracking into yet another hickory nut like an obsessed squirrel before the winter. Scott was also becoming addicted to them, like it was opium in a shell. We moved onward along the path, trying to get ahead of the masses, only to hit the biggest, most miserable traffic jam on approach of the western cablecar station. There were literally hundreds of people corralled in a fenced pathway only about six feet wide, for as far as the eye could see — like a Great Wall of People. Even the people being carried up in throne chairs didn’t look to be having a good time. A few times we tried to jump the fence with others to hike along the sidelines, but were stopped by stern Chinese police officers who were ordered to keep everyone moving in an orderly albeit slow fashion. “This isn’t enjoyable,” Scott said, after eating another hickory nut. “I’d rather be walking than standing.” We had already been stranded in pedestrian traffic for an hour or so. Juju asked around and was told that it would be three more hours of traffic before getting to the cablecar station, and then there would be even more heavy pedestrian traffic going down the steps from there. “No, I don’t care. We’ve seen enough,” I answered. “It’s all going to start looking the same anyway, and the sky isn’t as dramatic.” The sky in fact was actually very dramatic, at least in terms of temperatures, with the sun blaring down on what was shaping up to be a scorcher. We bid our new friend goodbye and hopped the fence to go back the other way, only realizing until he was lost in the sea of people that we had forgotten to swap e-mail information. Alas, that’s one of the Ways of Independent Travel; friends come in and out of your life like busboys in a restaurant, never to be seen again. FOR THOSE WHO DON’T KNOW, “stinky tofu” is a delicacy within Chinese cuisine, although you’d never know when you engage its aroma, which smells like an animal died under your kitchen sink. It tastes pretty good though, and it was that snack that tied us over for a while — or at least until the next hickory nut. “I can’t stop eating these,” I said, pulling another one out of my pocket. The descent down Huang Shan was a lot easier; it only took us about twenty minutes to walk back to the eastern area we started from without all the westbound traffic. With enough walking for the day, we simply came down the mountain on a smooth Dopplemayr cablecar ride, admiring the scenery and the weird round rock formations — Juju kept her spirits up despite her fear of heights. The three of us agreed that the cablecar ride afforded us time to do the other to-do at Huang Shan: the hot springs at the aptly named “Huang Shan Hot Springs” resort. For just 200 RMB ($29 USD), you could get a day-long pass to use all of the hot springs available: the regular pool of thermal water, or the ones infused with: white wine (for blood circulation and cold prevention), red wine (for skin health and blood enrichment), coffee (for skin moistening), or milk (for skin moistening and nail strengthening). As interesting it was to bathe in things I normally drink, the best baths were the ones with a little something extra: the Bath of Sands, where heated red balls soothed the mind and soul, and the “Intimate Fish in the Hot Spring,” where you soak your feet in a shallow pool and have little fish eat away your dead skin (wait for it). “I don’t know if I can do this,” I said, giggling my head off and causing a small scene, ticklish with every nibble of a baby fish mouth. But I closed my eyes and tried to ignore the sight of being eaten alive, until I got used to the sensation. And speaking of eating, there was of course, more of that. The resort had a snack bar of assorted Chinese desserts and snack foods, which tied us over until the rest area food (huang zhong huang da bing, a regional meat and spice-filled pastry; and a vacuum-packed piece of smoked chicken leg), which tied us over until a late dinner back in Shanghai (fried rice noodles, fried rice, and black-skin chicken soup) — a quick meal after a long six-hour drive (made a little bit interesting with a fireworks show near Huangzhou). “You’re still eating those, huh?” Tom said, when we surprisingly ran into him by chance at the bus station/parking lot, just as we were about to leave Huang Shan for Shanghai. “What are the chances that we’d run into him?” Scott wondered. Tom filled us in on what we missed by not “moving on” with him, which was more of the same: more people and more scenery — but nothing that was better than what we’d already seen. “You saw some pretty good stuff,” he assured us. We filled him in our our hot springs afternoon of relaxation, how we spent the entire time enjoying spa treatments while he was corralled with hundreds of tourists like cattle by the Chinese police. “Yeah, that was probably the right option,” he said, smiling. We finally swapped contact info and went our own ways. “Try the fish,” I recommended as he went off to kill time and relax at the hot springs before his late night flight. 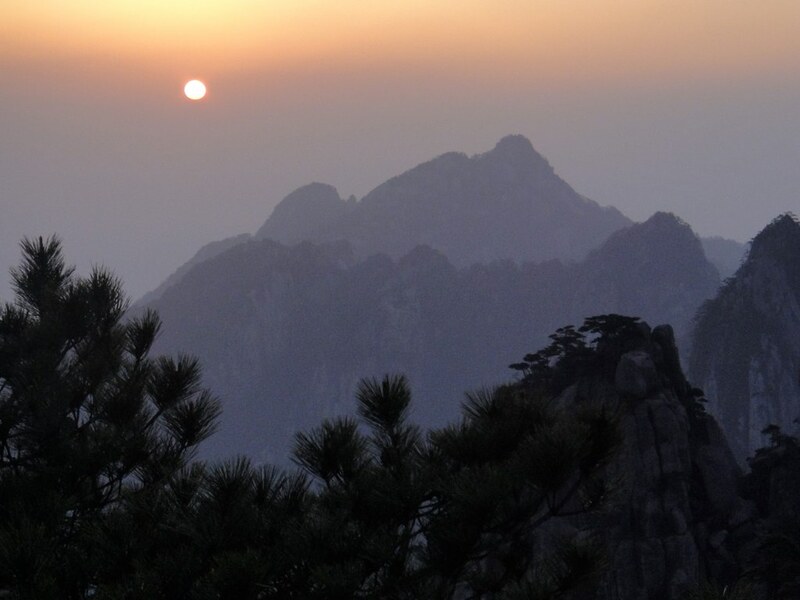 Tom came and went, and came and went again — as it sometimes goes in the Ways of Independent Travel — just as hundreds of tourists will come to Huang Shan again and again, for as long as its peaks continue to inspire. Greetings from Seoul, where I just shoved a slithering tentacle in my mouth. I’m behind just one Shanghai entry and then I’ll be caught up to here. I’d say “hundreds of people” is a bit of an understatement! will those little fishies eat bunions and corn on jacked up feet? Good website. I like the all pages and all comments. Thanks for all!!! Regards!!! Let us get straight to the point:1.Looks: A lot of women buy replica LV Monogram Miroir handbags without really caring about the brand or the name. When they go to a local shop and pick up a design they like, the LV Nomade cheap handbags that there is a Gucci or Louis Vuitton signature somewhere almost goes unnoticed. That the Lancel replica are a bargain at $100-$400 a piece increases their availability. 2.Aura: replica handbags have an envious exclusivity about them. When the likes of Victoria Beckham and Jennifer Aniston flaunt their replica Dooney and Bourke handbags, they are in effect proclaiming to the whole wide world that they belong to an exclusive club of the rich, famous and stylish. cheap LV Monogram Multicolor bags allow the average, office-going, bus-climbing woman a chance to partake of some of that aura of exclusivity.3.Cost: This is undeniably one of the most significant factors that contribute to the popularity or YSL handbags. Authentic designer brands can easily make you poorer by $600-$5,000! Most women cannot imagine spending that kind of money on Juicy Corture cheap handbags. At the same time, designer brands stand for quality, style and beauty. When the same quality, style and beauty are available at a highly discounted price, it makes sense to buy Proenza Schouler bags. 4.Quality: There is no doubting the quality of authentic luxury brands. When it comes to Proenza Schouler cheap, you can find two different varieties of the market. The first is a rip-off and is an attempt to provide consumers good looks minus quality. These LV Monogram Glace handbags are generally available at street side shops for a mere $50 or $60. The second kind of cheap Juicy Corture handbags are designer inspired, no doubt, but, they are high quality Samantha Thavasa replica that abide by rigorous market standards. These cheap LV Epi Leather bags are somewhat more expensive, but give you good return on your investment. The workmanship is of such quality that most people would not be able to make out LV Monogram Vernis replica handbags from the authentic. 5.Authenticity: A good number of people who want to buy authentic designer brands are often robbed of their money by con artists who sell cheap Gucci instead of authentic brands. But when you make a conscious decision to buy cheap Coach bags, you do not have to fear being cheated by spurious sellers. 6.Guarantee: Many reputed manufacturers of designer inspired Celine replica handbags offer a guarantee period of one week to 10 days during which time the consumer is allowed to inspect the LV Nomade replica handbags closely and make sure that they are satisfied with it in every way. Thus, consumers who chose to shop from highly reputed manufacturing companies get great Bottega Veneta cheap at bargain prices.As the rage for luxury brands increases, it is but natural that there would be a parallel increase in the demand for replica LV Mahina bags. After all, which woman can resist the lure of stunning good looks at budget prices?